‘Aro’ now GCH Desert Reef’s Twiilight Going Uptown finished his Grand Championship today! He is our first Bred By Grand Champion! 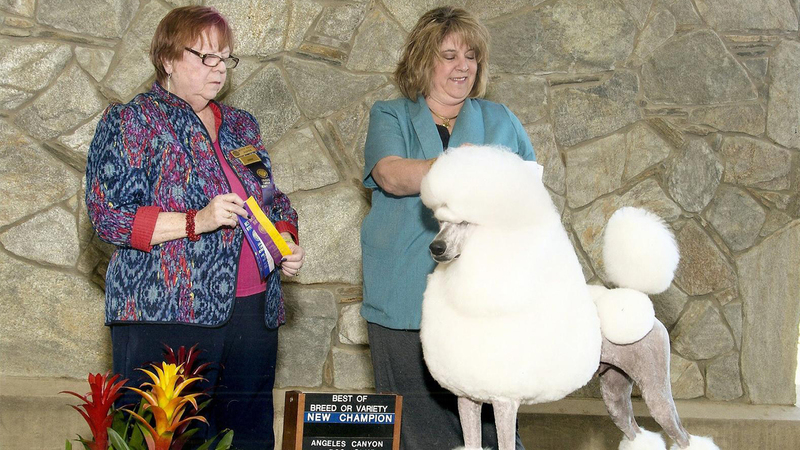 Congratulations to his owner, Pam Green, and his co-breeder and owner Karen Green! Aro was the male pick from our ‘Ava’ and ‘Tucker’ litter. He is littermate to ‘Aspen’. Aro was lovingly regrown out after he had been cut down to go back out for his Grand! Many thanks for Pamela for doing this! We also want to thank Daniel Villareal and Chris Bailey for their beautiful presentations of Aro to make us proud. Aro has already sired a handful of liters and is producing nicely! He already has CH son ‘Gable’ who finished at a very young age.